Need more than one USB port? Get ready to pack extra accessories in your bag. If you like to travel light, compromise is a way of life. 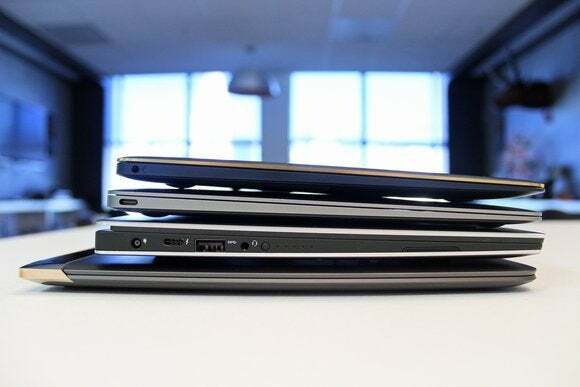 We’ve seen a bounty of ultraportable laptops this year, and everyone of them has had to give at least a little on weight, price, hardware, or build quality. LG’s Gram 15 had that big screen and insanely low weight, but its keyboard and trackpad were mediocre. The excellent Dell XPS 13 tipped the scales just a bit more than some similar rivals. A slew of Surface clones offered cheaper or flashier alternatives to Microsoft’s 2-in-1, but some features like the OLED screen on Samsung’s TabPro S came with quirks. Asus’s ZenBook 3, for its part, goes so minimalist that it flirts with being impractical. Unlike its 13.3-inch and 15.6-inch ZenBook siblings, this compact 12.5-inch laptop has just two ports. And it’s not one for data and one for charging—a single USB-C port handles both. The other input is a combo audio jack. 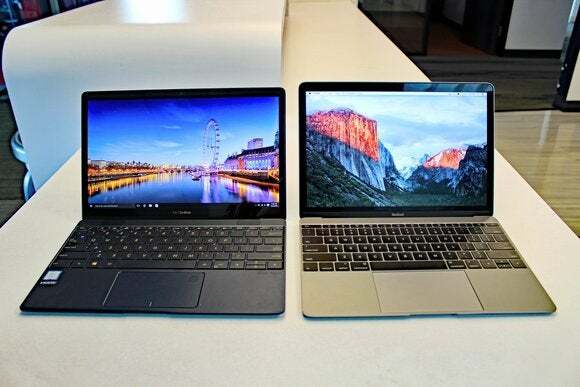 Yes, the ZenBook 3 is essentially a Windows version of the 12-inch MacBook. It’s kind of a shame, too, because the design hamstrings the cutting-edge hardware stuffed inside. Our $1,599 review unit is the more expensive of the two, with a 15-watt 7th-generation Kaby Lake Core i7-7500U processor as the headliner. Announced back in August, this freshly launched CPU has a base clock speed of 2.7GHz and a boost clock speed of 3.5GHz, and shows some nice gains in performance over 6th-generation Skylake processors. Pictured: Asus ZenBook 3 (top), 2015 MacBook, Dell Skylake XPS 13, HP Spectre 13.3 (bottom). That newly launched CPU comes paired with a zippy 512GB Toshiba PCIe-NVMe Gen 3 x4 M.2 SSD and 16GB of LPDDR3/2133 RAM. You can’t find components much faster than these right now: For example, transfer rates of the storage drive sped along at 1.7GBps for sequential high-queue reads and 1.4GBps for sequential high-queue writes in CrystalDiskMark 5.0.2. The RAM used is also special. Asus told us they worked closely with Intel to enable the 2,133MHz speed with Kaby Lake. The new 7th-gen CPU officially supports only up to 1,866MHz using the power-efficient LPDDR3—official support for 2,133MHz is only with DDR4. If you want to spend less cash, you can instead opt for the cheaper $1,099 configuration with a 7th-generation Core i5-7200U processor, 256GB PCIe-NVMe Gen 3 x4 SSD, and 8GB of LPDDR3/2133 RAM. You lose the lightning-fast fingerprint reader found on the more expensive model, though. Both systems come with a clear (if slightly washed-out) Gorilla Glass 4 12.5-inch IPS-like display, dual-band 802.11ac Wi-Fi, and Bluetooth 4.1. And of course, those two lone ports. If you do everything in the cloud, or mostly just surf the web, that single USB-C port might not seem like a big deal. In exchange for the lack of ports, you get a sleek and very portable laptop with looks that rival Apple’s similarly designed MacBook. (The ZenBook 3’s “aerospace-grade” aluminium doesn’t come in solid gold or rose gold, though.) Asus even includes what it calls a Mini Dock—a dongle that expands that lone data and charging port into one USB-C, one USB-A, and one full HDMI. The Dell XPS 13 and HP Spectre 13.3 have far more generous port selection than the ZenBook 3 and MacBook. It’s a problem, though. People who need to plug in more than one data device or connect to a non-HDMI display will feel it most, because the idea of traveling light and unencumbered just flies right out the window. You can’t even get around some of it with an external drive that natively uses USB-C, as the Mini Dock’s USB-C port is charging-only. So for example, connecting a Nexus 5X and an external storage drive means you have to choose between them, use a USB hub, or buy a dock with more ports. (Asus will specifically offer an optional Universal Dock for $130 that offers USB-C, two USB 3.0 Type A ports, full-size HDMI, a VGA port, ethernet, separate audio and microphone jacks, and an SD card reader.) And then you have to carry all the resulting extra cables and/or adapters, too, with the added hassle of carrying and keeping track of everything. The ZenBook 3's outer shell isn't an exact copy of the MacBook—after all, it has its audio jack and USB-C port on opposite sides than the MacBook. Users who only occasionally use external devices still suffer a bit, too, if they like to use the latest and greatest technology. The ZenBook 3’s USB-C port is USB 3.1 Gen 1—so all data transfers are limited to that 5Gbps maximum transfer rate. You’ll never get to take advantage of the internal SSD’s blazing-fast reads and writes when using a USB drive, even if that drive is equally as fast. Data transfers of a 6GB .mov file and 30GB MKV file between the SSD and a Samsung Extreme 900 averaged in the 300MBps range. Asus says that due to the motherboard’s chipset limitations, it would’ve had to add an additional controller for 10Gbps speeds, and the motherboard design was already cramped. Still, it’s sad to see a high-end component held in check by a port that moseys along at the same pace as USB 3.0. Unfortunately for cloud users, the keyboard and the trackpad on the Asus ZenBook 3 can’t be evaded or ignored like the lone USB-C port. The Chiclet keyboard is the worse of the two—I’m usually fairly patient with the inputs on two-pound ultrabooks, but this laptop’s keys are an acquired taste that I still disliked even after growing used to them. They have little travel and don’t give much tactile feedback when they bottom out, and even after adjusting to them I found the whole typing experience deeply unsatisfying. The only positive about the keyboard is that it doesn’t feel mushy—but that’s because the keys are too shallow to allow that kind of sensation. I never thought I’d say it, but I slightly prefer the 12-inch MacBook’s keyboard. The trackpad is a more pleasant experience, despite sharing the keyboard’s shallowness and lack of firm finish when clicked. It’s highly responsive, allowing you to avoid left clicks because taps are so easily recognized, and has a slick surface that lets your fingers glide smoothly over it. The fingerprint reader enhances the experience by offering ultra-fast recognition of your finger. As divisive as its outer shell is, the Zenbook 3’s performance is top-notch. 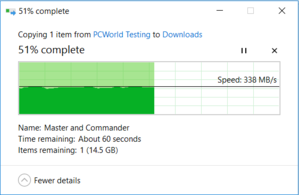 (Which makes that USB 3.1 5Gbps port all the more disappointing.) Its components help put the ZenBook 3 among the top ultrabooks we’ve seen—everyday tasks run like butter. You don’t purchase an ultraportable for gaming or content creation. You buy it so you can write email, edit documents, video chat, and order too much stuff from Amazon. 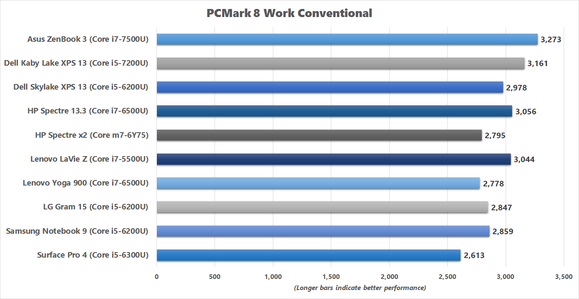 PCMark 8’s Work Conventional test simulates that kind of use, and while any score above 2,000 will be plenty adequate for such work, its result of 3,273 means you should have a slightly snappier experience. 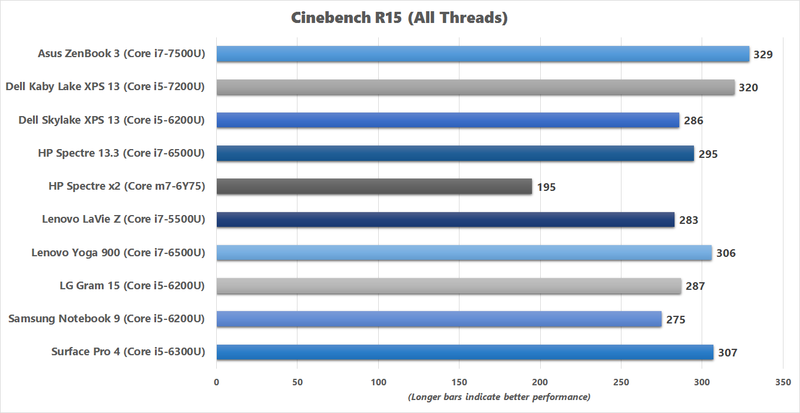 Note the difference in performance between the Core i7-7500U in the ZenBook 3, the Core i5-7200U in the Kaby Lake XPS 13, and the Core i7-6500U in the Spectre 13.3. While there is some distinction between them, it’s not much. The ZenBook’s Kaby Lake i7 part is 3.5 percent faster than the Kaby Lake XPS 13, and 7.1 percent faster than the Spectre 13.3. You won’t likely feel a significant difference between these machines when editing a Word document or chatting over Skype. 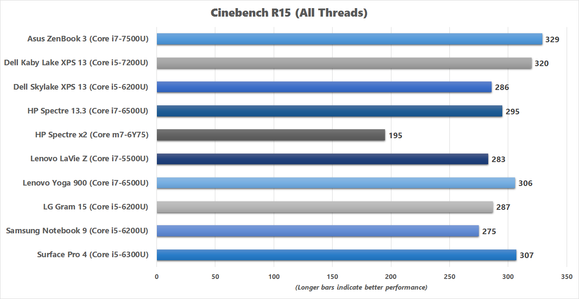 To better examine a scenario where a Kaby Lake Core i7 processor would provide more benefit, we fired up Cinebench R15. This benchmark measures pure CPU performance by rendering a 3D scene, and because it takes only several minutes, it gives a feel for how a laptop will handle short-term intensive tasks. While the ZenBook 3 shows a modest performance gain over the Core i5-7200U in the Kaby Lake XPS 13 (just 2.8 percent), it outperforms the Spectre 13.3’s Core i7-6500U by 11.5 percent. That’s not too shabby for a laptop that has more limitations on cooling than the larger XPS 13 and Spectre 13.3. But what about the MacBook, the ZenBook 3’s most obvious competition? Unfortunately, we didn’t have a Skylake-based MacBook in the office to test, but we can ballpark the current MacBook’s performance by looking at Windows laptop with a similar CPU. The ZenBook 3 stomps all over HP’s Spectre x2: It outdoes the x2’s Core m7-6Y75 by 68.7 percent. Even accounting for the Core m7 MacBook’s slightly faster clock speed, you'll be looking at a big difference between it and a ZenBook 3. That better performance does come with a cost, though. 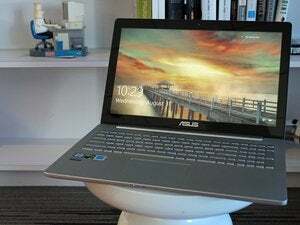 Asus allows the fans to run on the ZenBook 3, while the MacBook is fanless and silent. You can hear the ZenBook 3 in a quiet room when the system’s under load. As mentioned earlier, ultrabooks aren’t designed for content creation. 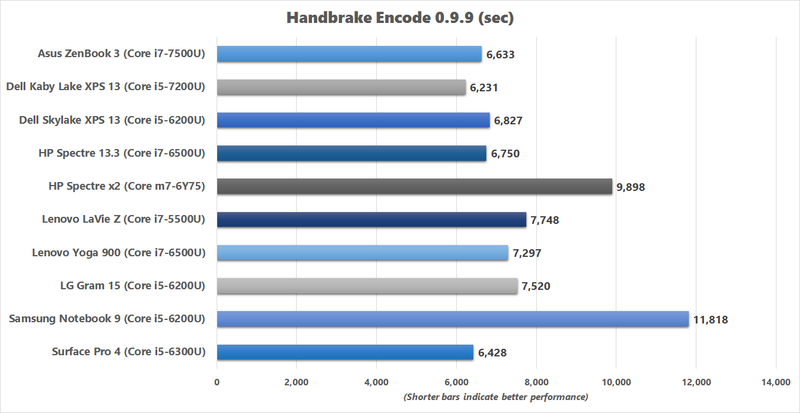 We still throw our Handbrake encoding test at them anyway, as a torture test to see how they deal with heavy CPU loads. Some laptops throttle performance as the CPU heats up, while others kick their fans into high gear. Yet others attempt to strike middle ground by doing a little of both. The more powerful a system is, the faster it converts our 30GB MKV to a smaller MP4 using Handbrake’s Android Tablet preset. 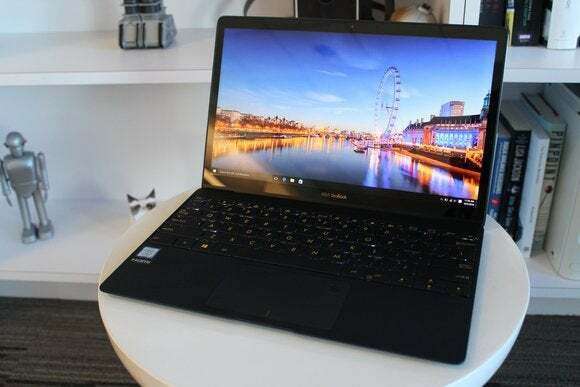 Despite its highly compact form, the ZenBook 3 still manages to keep up with systems that are larger and have more cooling—it finished the encode in an hour and 51 minutes. That’s about on par with the Spectre 13.3 and Skylake XPS 13, which both took about an hour and 53 minutes. The Kaby Lake XPS 13 and its Core i5 processor beat the ZenBook 3 by more than 6 minutes, which just goes to show that cooling can make a difference in performance. While we weren’t able to confirm it because Intel’s XTU software doesn’t work with Kaby Lake just yet, my guess is that the ZenBook 3 slightly lowers its clock speed once the core temperatures rise under extended load, instead of spinning the fans faster (and louder). The ZenBook 3 sports humble integrated graphics, so don’t expect to play much more than lightweight indie games on it. Still, its HD 620 Graphics show some modest gains over the last-gen HD 520. 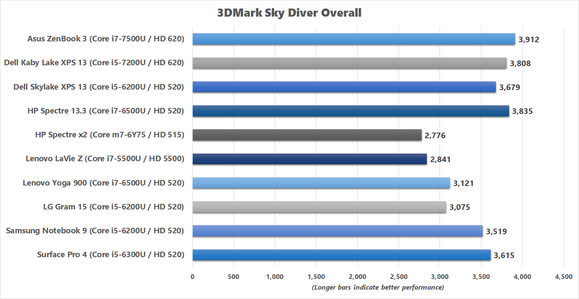 In 3DMark’s Sky Diver benchmark, a synthetic graphics test that simulates DX11 gaming at 1080p on Medium settings, the ZenBook 3 scored 3,912. If you actually want to play a game, you’re better off trying it on Medium settings at 720p (if that), but this Sky Diver score shows that the ZenBook 3’s faster RAM and Core i7 part might be giving it a bit of a leg up on the Kaby Lake XPS 13, which uses LPDDR3/1866MHz RAM and that Core i5-7200U processor. Versus the Spectre 13.3’s Core i7-6500U and older HD 520, the ZenBook 3 outperforms it by a slim 2 percent. But against the Spectre x2 (a.k.a. our proxy MacBook), ZenBook 3 clearly comes out ahead by a hefty 41 percent. The Spectre x2’s HD 515 Graphics aren’t so much the problem as that lower-power chip and fanless design. 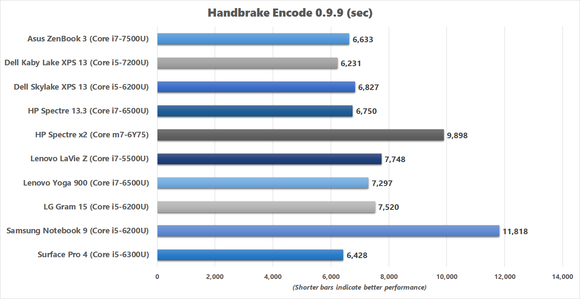 It would have been unsporting to mention that when discussing the Handbrake benchmark, since none of these ultraportable laptops are designed with content creation in mind—but some people do like to play games on their laptops, even if they’re not blockbuster AAA titles. 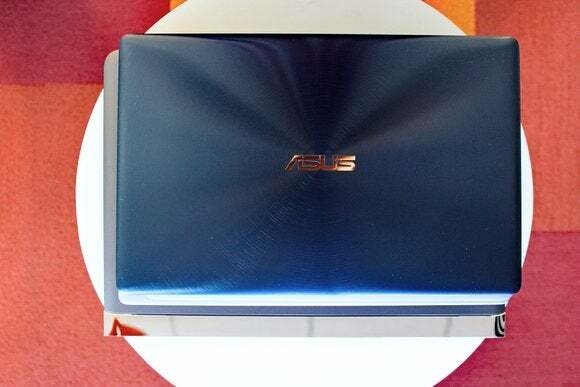 Asus should get credit for putting in the extra power into this compact laptop, as it expands what you can do with the ZenBook 3 in comparison to a MacBook. Asus also does a nice job with battery life on the ZenBook 3. 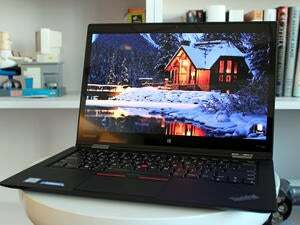 Despite the more power-hungry CPU, this laptop lasted just over eight hours in our video rundown test, which involves running a 4K movie file on loop in Windows 10’s native Movies & TV app. That’s 100 minutes longer than Surface Pro 4, which has a similar panel size but a higher-resolution touchscreen and a slightly smaller battery. 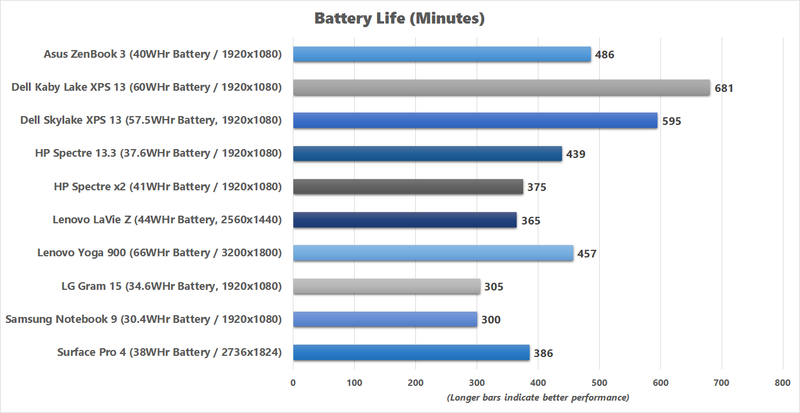 On the flip side, the Kaby Lake XPS 13 lasted 3 hours and 15 minutes longer, but its battery is about 50 percent larger than the 40-watt-hour pack inside the ZenBook 3. It’s unclear how the MacBook and its 41.4-watt-hour battery would do in a similar rundown test, but with that lower-watt Core m processor, we’d guess it’d be perhaps an hour or so longer than the ZenBook 3. Asus touts the ZenBook 3 as a superior MacBook alternative, and I’d have to partially agree. In a lighter and almost equally compact package, you get a much faster processor—one that better matches up with the fast storage and RAM paired with it. The fan noise you get in exchange for that power is very tolerable. It’s more of an audible hum than a noisy jet-engine roar. You also pay less than for a MacBook—the starting price for MacBook is $1,299 for a Core m3 processor, 8GB of LPDDR3/1866 RAM, and a 256GB PCIe SSD. Processor differences aside, that’s $100 more than a ZenBook 3 with the same amount of memory and storage. Meanwhile, the $1,599 MacBook has half the amount of RAM as our $1,599 ZenBook 3 review unit. I even think that the one area that Asus downgraded (relative to the MacBook) is a smart decision. While the MacBook features a 2304x1440 display, the ZenBook 3 sports a less glamorous 1920x1080 screen. I’d argue that on a 12.5-inch screen, the lower resolution is far more comfortable to work with. If you don’t give two figs about Apple and just want a compact Windows machine that’s easy to carry around, well—the ZenBook 3 is really portable. I carried it to and from work on public transit without noticing it too much in my backpack. It performs well, too. So if you can live with just one USB port, there’s a lot to like. 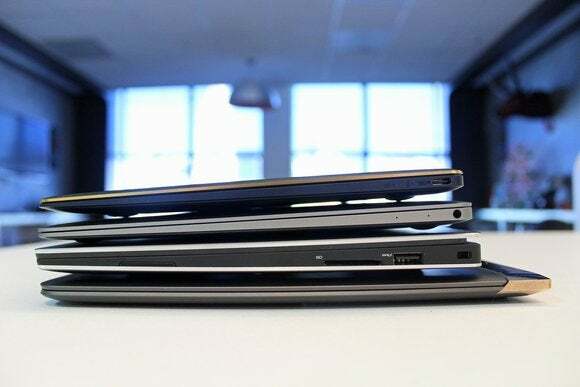 If you can’t—well, there are plenty of excellent ultrabook competitors to choose from. You’ll just have to pick a different feature that compromises on something you don’t care about. The Asus ZenBook 3 is extremely compact and lightweight, but its keyboard and single USB-C port are a bit of a letdown.